Casa Herrera Hand Stretch tortilla system works great for other flat bread products too, like chapati, pita bread, and pizza. 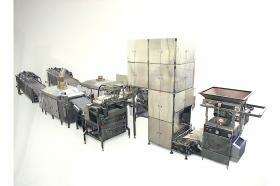 It comprises a divider rounder, over head proofer, flour sheeter, hot plate, oven, and cooler. It's ideal for high production of large size products like soft tortillas, or tortillas for burritos, up to 16" in diameter that have speed limitations when running in a press line. The hand stretched tortilla is preferred by a market sector and it can rapidly expand your line of products. This system can be semi-automatic with Relay logic controls, or fully automated with PLC and Touch Screen controls. Presser elevator to compact the dough balls for sheeter rollers. Dual lane Flour Head with stainless steel rollers. Flour applicators to avoid sticking. Hot plate, gas or electric to stretch tortillas by hand for a home style look.